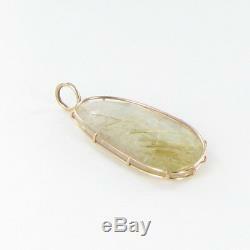 Heather B Moore Wire Charm Pendant Rutilated Quartz 14k Rose Gold Cage. Clasp: N/A, 4mm diameter bail. 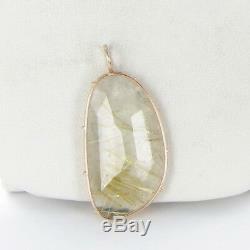 Description: Irregular shaped faceted rutilated quartz encaged in 14k rose gold wire. 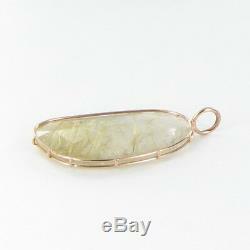 Composition: 14k Rose Gold, Quartz clear Total Weight, Grams: 5.4g. Measurements: 41mm total length (including any bail or jump links) by 20mm widest, by 4mm thickest. Condition: The piece is new, with the retail tag(s) removed. This will appropriately packed to ensure safe arrival. Unless we describe an item as being pre-owned or lightly used, it should be assumed that ALL goods are BRAND NEW. We NEVER polish or refinish merchandise and state that the item is new without tags.